There are 3 ferry routes operating between Gotland and Sweden offering you combined total of 61 sailings per week. Destination Gotland operates 3 routes, Visby to Nynashamn runs 5 times per day, Visby to Oskarshamn about 3 times daily & Visby to Vastervik about 5 times weekly. As the frequency and duration of crossings on some routes varies we would advise that you do a live search for crossings from Gotland to Sweden to get the most up to date information. Sweden’s largest island, Gotland lies in the heart of the Baltic Sea with the mainland to the west and Latvia to the east. With the most hours of annual sunshine in Sweden alongside a rich history and beautiful surroundings, Gotland has long been a popular destination in Scandinavia. Characterised by myriad church ruins and impressive fortress walls, the medieval town of Visby is the island’s hub, whilst the coastline is blessed with stunning sandy beaches. So whatever the season, Gotland has something to suit. 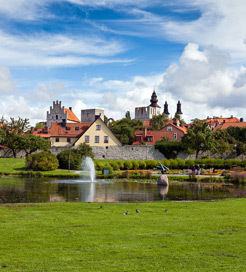 The island is well connected with the Swedish mainland by ferry, with a couple of frequent routes departing from the port of Visby. 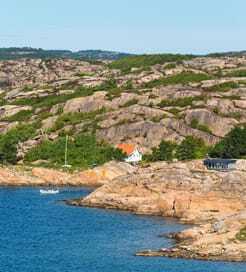 Gotland is also a useful departure point for the Swedish capital, as the arrival port of Nynashamn lies just 58 kilometres south of Stockholm.